Step 1 Preheat your oven to 350ºF. Step 2 Melt your fat of choice in a saute pan, over medium low heat. Add the mushrooms, garlic and diced onion. Let them sweat out together until the mushrooms have released all their liquid, said liquid has evaporated, and the shrooms have started to brown. Step 3 While that’s going, set a pot of salted water on the stove and bring the water to a bowl. Toss in the kale. Set up a large bowl full of ice water. Once the kale is almost cooked through, about 15 minutes, place it into the ice water. This is called blanching, the ice water step is very important because it will keep the kale a bright emerald green, otherwise it’ll turn blah. Once the kale is cool enough to handle, squeeze out as much water as possible. Place the thoroughly dried kale in a casserole dish. Step 4 Once the mushrooms, onion, garlic mixture is where you want it, add it to a food processor and pulse it into a paste. Put the paste make into the saute pan. Add the cream and let it cook and reduce for about 5 minutes. Pour this mixture into the casserole dish. Step 5 Mix everything together and stick in the oven until you see the sides of the casserole dish get bubbly. Step 6 While that’s cooking, we’re going to fry some onions. Wipe out the shroom, cream, onion saute pan and melt about ¼ c fat of choice over medium-high heat. Add the onions and cook until golden brown. Place the onions on top of the casserole and serve. 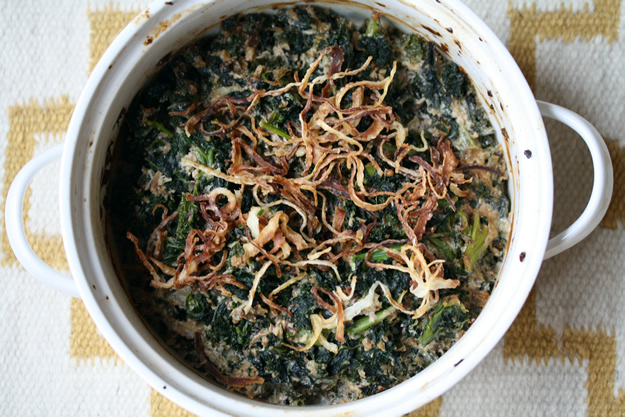 Green bean casserole, you know the culprit–canned food mixed together and baked. Oddly enough, I think it may be the only holiday dish that’s made the same way by all regions of the U.S. No? It’s pretty tasty, I suppose, but a fresh, homemade version is all the more tasty. Leaving out the green beans and substituting fresh kale, along with a rich, mushroom sauce, helps this dish come out of its shell…errrrr, can.